As he stood near the doorway, one or two panting figures rushed up the steps, and flung themselves at a large book which stood on the counter near the door. Mike was to come to know this book well. One of the minor curses of my day-to-day existence is being habitually late for work — not through personal tardiness, I hasten to add. Mine is not the life of Joss Weatherby (Quick Service), who oversleeps after late nights at the gambling table, or Barmy Fotheringay-Phipps (Barmy in Wonderland) who goes on toots with Mervyn Potter. No, I go to bed at an early hour and rise regularly at 5.00am to write. Unlike ‘Old Nick’, who cuts an ‘…elegant figure dressed in the extreme of fashion’, my outer crust is not my priority. The best I can manage is a hasty approximation of office wear, with hair and face presented pretty much as God intended them –presumably as some sort of joke. I may never be admired as a testament to English womanhood, but the plus side of maintaining this sort of public image is that it requires very little upkeep. A simple donning of shirt, trousers and shoes is all it takes. In a former workplace, I was known as ‘the girl with wet hair’. I’ve even been known to throw a dress over my writing clothes to save time. But I am always ready to leave home at the required hour. It is at this point in the morning routine that I wake the half-portion and complete an exercise known to parents everywhere as ‘the school run’. My daughter gets herself ready without a fuss (most of the time). We walk to school together and wait at the gates amongst a sea of families, ready to storm the Bastille when the gate keeper arrives. At precisely 8:31am, or possibly 8:32 if the gatekeeper has been on a a toot with Mervyn Potter, I am ready to begin my commute. I dash to the bus stop with an earnest vigour that would make Psmith proud. This keenness on my part goes unseen in the workplace. What colleagues notice is the empty desk at 9:00am. There is no martyred p. (as Archibald Mulliner puts it) where the martyred p. should be. When I open the door to the cosy little crypt we like to call our office, I am met by the dazed expressions of workers who began their toil beneath the artificial light a good deal earlier. I offer an embarrassed “Sorry, I’m late,” but it sounds hollow even to my ears after the 635th consecutive occasion. The disciplinarians among you will no doubt be tutting to yourselves, feeling that it’s time I changed my attitude.”Martyred ‘p.’s due to toil in crypts at 9.00am should begin to toil at 9.00am,” you say, –no doubt from force of habit. Mr. Duff, Ham magnate and Managing Director of Duff and Trotter, felt the same way about Joss Weatherby in Quick Service. Old Nick’s director at the troisieme bureau of the Ministry de Dons et Legs in French Leave would agree. J.G. Anderson, employer of Barmy Fotheringay-Phipps in Barmy in Wonderland would be banging the desk by now. I suggest you do it too –it’ll make you feel better, and the exercise is no doubt beneficial for someone in your position. There is little I can do about my morning routine, but re-reading Quick Service (and what a fantastic book that is) has prompted me to revise my attitude instead. As so often happens when reading Wodehouse, I stumbled across a passage so ripe with wisdom and good example that I was encouraged to change my ways almost immediately. The passage pertains to a disagreement between the aforementioned Mr. Duff and his employee Joss Weatherby, who has breezed into the offices of Duff and Trotter several hours later than expected. 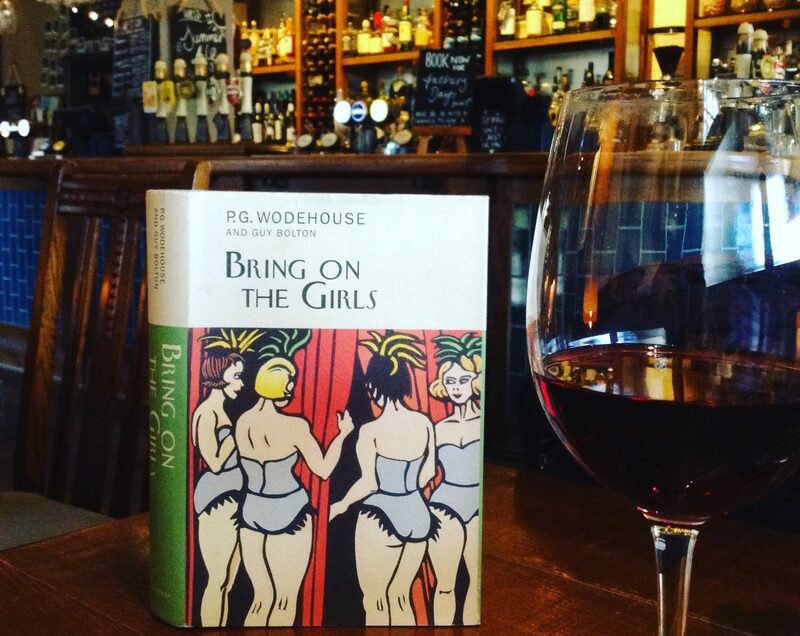 Wodehouse does it again! A mere four lines of instructive prose and I am a new woman. No more feeling like a worm uttering pathetic apologies, if indeed that’s what worms do. Henceforth, I shall breeze into the office with a benevolent smile, in the hope that my arrival injects a dash of sunshine into the lives of others. I expect this new attitude will bring me a sort of warm, inner glow that will last, oh, at least an hour I should think. I sympathise – my office is known by my colleagues as Middle Earth. Unfortunately I am not of Hobbit proportions (5’10”) and so I often end up with a face reminiscent of Psmith the Worker. Oh dear. That sounds grim. If you ever need to give it up, you could always go in for a new career in limbo dancing. That’s a great line. I shall definitely pinch that when the need arises. Thanks Paul. Wonderful stuff! Most of the best of Plum came from his oddly amusing take on some, often his own, reality. When I read or hear of the p., I can not help flashing my alleged mind on the Jeeves line to Bertie, from, I think, Indian Summer of an Uncle, when Bertie refers to the young thing as of the p. and Jeeves intervenes to say, surely the sturdy lower middle class. A wonderful distinction to dwell upon. Ahh.. An interesting distinction in class, nicely put. As an expat Australian living in England, I find the overt class distinctions (surprisingly alive and well) here quite difficult to fathom. Everything from the paper someone reads, to the supermarket one frequents, is taken as a sign of our class, to be analysed by those who like to put us all in our rightful places. Wodehouse’s occasional observations on the theme remain pretty well relevant as far as I can tell. What is amusing to observe, is the constant, sometimes minute, calculations that all English people unconsciously go through in any conversation or interaction in order to ‘place’ you. Yes — for a long time, I mistakingly thought I was fascinating because people would ask me so many questions. I’ve got used to it now. Sometimes I deliberately throw in a few ‘furphys’ (that’s probably an Australia-only expression, for a tall tale) just for fun, to watch the reaction. In my experience the working classes just want to know whether you’re ‘them’ or ‘us’; it’s the socially anxious strand of the middle classes that are always so keen on ‘placing’ you. My father’s family are working class and my mother’s family are lower middle class but I’ve spent my working life amongst the middle class ‘intelligensia’; I have a country background but have spent my adult life living in cities – the attempt amongst the class obsessed I’ve met to unravel all the mixed signals I give off is quite amusing. Those, very few, of the upper classes I’ve met are so socially secure it never even crosses their mind – the only division they have is ‘people we don’t know’; very similar really to the working classes. I can just imagine this. I spent a year or so living in Henley-on-Thames and studied its public houses (for.. err.. research). I loved them — for the characters, excellent company, and the way in which the upper and working classes mix with surprisingly little snobbery. But the school yard, consisting mainly of middle classes mothers, was another matter entirely. I had never thought of myself in terms of class at all before that, but it became evident that I’d been assessed as lowering the tone — I don’t think more than three people spoke to me in all my time there. The school pick-up was utterly demoralising — and my daughter was bullied terribly. Fortunately she is much happier now, and I got some great material for a novel from the experience . Even so, it was a wrench to leave my lovely local pub behind. The writer’s mantra – ‘it’s all copy’. I saw a documentary once on class that made a similar observation – John Prescott was interviewing a glamour model turned celebrity type whose name escapes me – and who came across as extremely shrewd and switched on – who said she had been sent to a supposedly ‘posh’ private school where the girls looked down on her and bullied her. Her point was that if the school had been full of really posh girls, rather than the socially anxious, they would have just accepted her as she was. I really do find the increasing extent to which people project their own insecurities onto some ‘hate figure’ they’ve constructed to ‘justify’ their own behaviour and make them feel better about themselves, very, very sad. Definitely — it all goes in my notes for future stories. I love the attitude you describe too, one that transcends the petty preoccupations of others. Actually, there’s the basis there for a comedy sketch satirising the English class obsession: a presenter saying ‘and welcome to What’s My Class’ and then a panel discussing the social ‘clues’ presented by a member of the public standing in front of them – ‘he’s holding a copy of the Guardian, so obviously left-wing public sector here’, ‘yes, but I detect a slight Estuary accent there – do you happen to drive a white van, may I ask?’ – which would obviously reveal more about them and their prejudices than the hapless MotP. Could be very funny. I love this idea, Victoria. Reminds me of the first time I posted a letter in this country and the cashier asked ‘what class?’ I was a shade perturbed , until I worked out what she meant. This should be part of the curriculum of all prestigious citadels of higher education. Much peace of mind would prevail. BP of employers as well as employees would come down, their cheeks would glow with that sense of inner satisfaction and job satisfaction levels would shoot up. Thanks, Honoria, for digging up this gem of wisdom! Quite so. Wodehouse shows us the way once more. This wisdom surely needs to be shared further – a reblog, if I may? The trick on these occasions is to breeze in as though you have been at a breakfast meeting that has run over. Facilitate this by taking two or three large manila folders home and filling them with typewritten A4, then arrive the following morning clutching these to your breast in one arm while your heavily overloaded briefcase dangles from the other. If you can get an acquaintance to ring your mobile as you arrive, so much the better. I love it. I once had a colleague who carried a clip board everywhere for the same reason. It’s just gone 9.00 – did you get to the book in time? Sorry, I missed these comments. It must have been my dedication to duty. But the good news is that I am on leave for a week from today. Bliss. I always tried to stack leave around a bank holiday too – it extends your time off with little expenditure of precious allowance. Although I was taken aback when a Canadian colleague told him he couldn’t get over how much leave we had over here – apparently they only get *two weeks a year*!!! Or you could ask your boss for flexi-time if he is such a good egg. The buzzword when I was working was the importance of employers promoting the ‘work-life balance’. Or, thought three – stay on at work 15 minutes after everyone else leaves, if it’s possible. Alas, I have to shove off ‘on the dot’ of five to collect my little darling. All I can do is skip lunch breaks. Habitually late for work? What are the excuses you normally come up with? Are there special tactics to be adopted to win over in a potentially embarrassing situation? P G Wodehouse is not about humour alone. He also has tips on such mundane affairs. Here is yet another delectable post from Plumtopia. Pray that your obnoxious boss does not get to read it. I love it – great quotes. Thanks Spink Bottle. He knew his stuff.